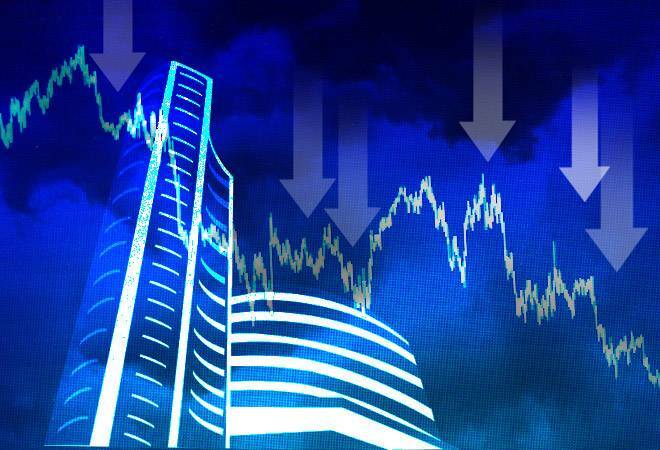 Foreign institutional investors (FIIs) have given Indian capital markets a big thumbs-down this year, withdrawing Rs 90,746 crore so far, the highest ever. Interest rate hike by Federal Reserve and a falling rupee led the FIIs out of the Indian market. FIIs have been on the withdrawing spree on the back of US providing more attractive options for investing. "FIIs pulled out funds from Indian markets mainly on account of sharp depreciation in Indian rupee, present rate hike as well as in expectation of future rate hikes by Federal Reserve, tight liquidity condition in money market and IL&FS event triggered pulling out of funds by FIIs in Indian markets," Astha Jain, senior research analyst at Hem Securities said. What has saved the markets from a potential mayhem is the Rs 97,739.02-crore investment by domestic institutional investors (DIIs) in 2018 which has kept the indices in the green zone on an year-to-date basis. Since 2002, FIIs have made net withdrawals from the Indian market only three times: 2008, 2016 and 2018. 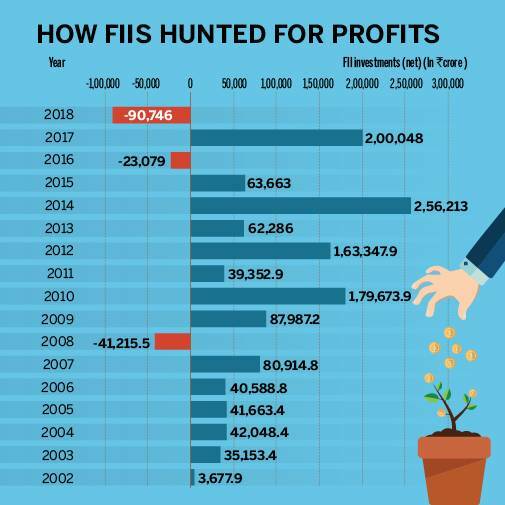 In 2008, when the recession hit the US market and Indian markets tanked, FIIs withdrew Rs 41,215.5 crore in search of safe havens for their funds. In 2016 too, FIIs were in bearish mood on the Indian markets withdrawing Rs 23,079 crore from the country. And this year, the markets have moved in a see-saw mode keeping investors and traders guessing about their future course. Earlier in the year, Sensex and Nifty hit their all time highs of 36,443 and 11,171 levels, respectively. However, markets came off their highs on imposition of 10% LTCG tax in Union Budget on February 1, ripple effects of rising bond yields in US on global markets and prospects of trade war between the US and its trading partners. On August 29, as part of another leg of rally, the market scaled all-time highs on better corporate earnings, higher global markets and surging midcap and small cap stocks. While the Sensex hit a new high of 38,989 intra day, Nifty hit new peak of 11,760 level. The Sensex had gained 14% on an year-to-date basis, Nifty clocked 11.19% rise during the same period. Since then, the markets have lost nearly 11% till date. Currently, the Sensex and Nifty have pared gains to 3.25% and 0.51% on an year-to-date basis. With market hit by heightened volatility in 2018, FIIs looked in no mood to stay in India. They withdrew a massive Rs 90,746 crore till October 15. In 2017, FIIs infused Rs 2,00,048 crore into the Indian market. Analysts have attributed the increase in FII outflows to high valuations of the Indian stock market and rising yields in the US bond market. Harendra Kumar, managing director, Institutional Equities at Elara Capital said, "Indian markets were trading at a very high valuation vs rest of Emerging markets pack (73% premium vs MSCI EM) in an environment where macro conditions are worsening - expanding CAD, increasing yields- leading to depreciating rupee, affecting dollar returns. Additionally, geo political environment has continued to be uncertain with persisting trade war concerns and sanctions on Iran, among others, prompting a flight to safety of FII flows. Lastly, increasing yields in the US has led to a declining yield spreads, making EMs that much less attractive." VK Vijayakumar, Chief Investment Strategist at Geojit said, "The FII selling is an emerging market phenomenon. It is more pronounced in India due to the high valuation in Indian market. The most important trigger for FII selling is the rising bond yield in US. The 10-year US bond yield is presently around 3.15 percent. This 'risk free return' is highly attractive for FIIs particularly in the context of currency depreciation in Emerging Markets. For India, INR depreciation is a concern in the context of surging crude and rising CAD."